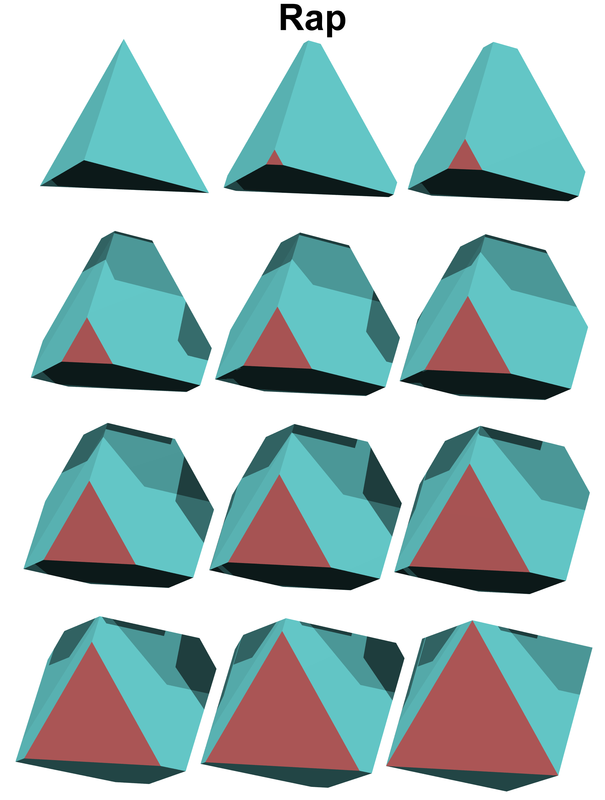 There are 21 triangular rectates divided up into 7 regiments of 3. The regiments are based on the following polychora: rap, rit, rico, rahi, rasishi, ragaghi, and rigogishi. Rap, rit, rico, and rahi are convex. In 3-D the rectates are based off of 4 regiments: Co-oho-cho, id-sidhid-seihid, did-sidhei-gidhei, and gid-gidhid-geihid. An interesting thing to note, is that sidhid, seihid, sidhei, gidhei, gidhid, and geihid never show up as cells (except for their prisms), although they do show up as pseudo-cells. In each regiment, the first two are tame, the last one is wild. All of these are orientable. 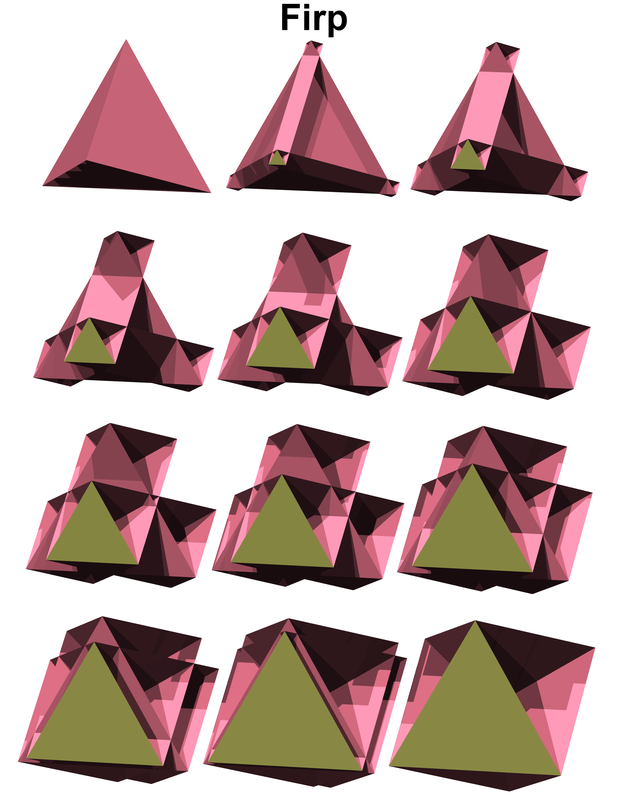 Following is a list of the 21 triangular rectates. 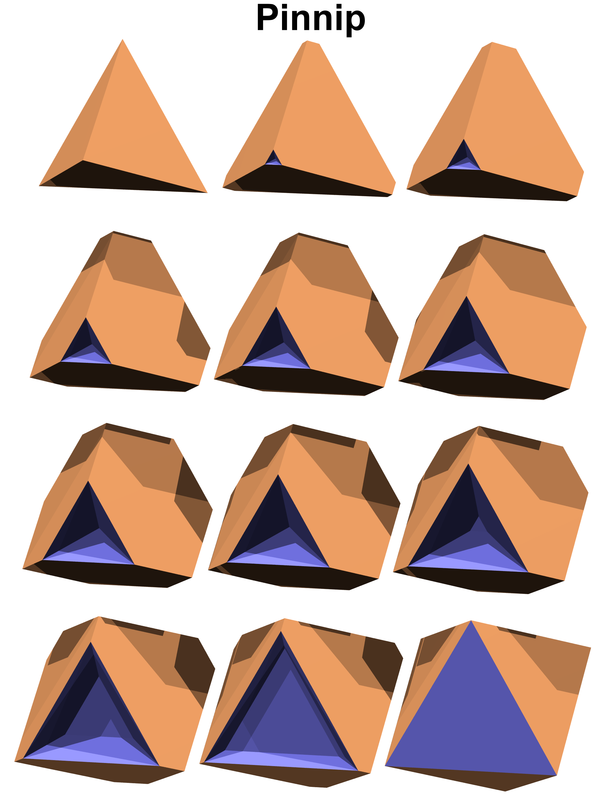 This regiment has pennic symmetry and commonly shows up in several uniform polytera as terons (4-D facets). 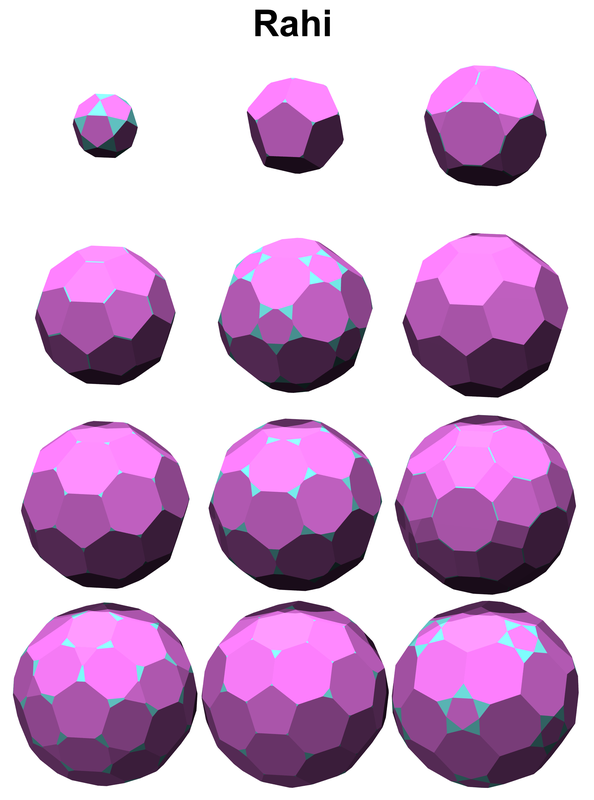 All of them have 10 vertices. Rap's symbol is ooxo. 39. Rap - rectified pentachoron. Its cells are 5 tets and 5 octs. Its verf is a trip (trigonal prism). It has 10 pieces with two types, LOC = 3. It is convex and semiregular. It is also the verf of hin (demipenteract). 40. Firp - facetorectified pentachoron. Its cells are 5 tets and 10 trips. 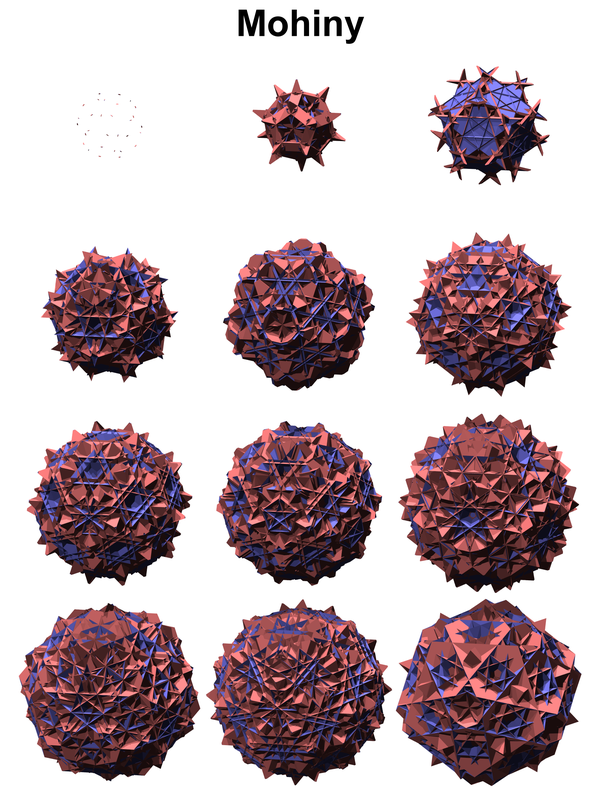 It also has 5 pseudo-thahs (thahs as pseudo-cells). 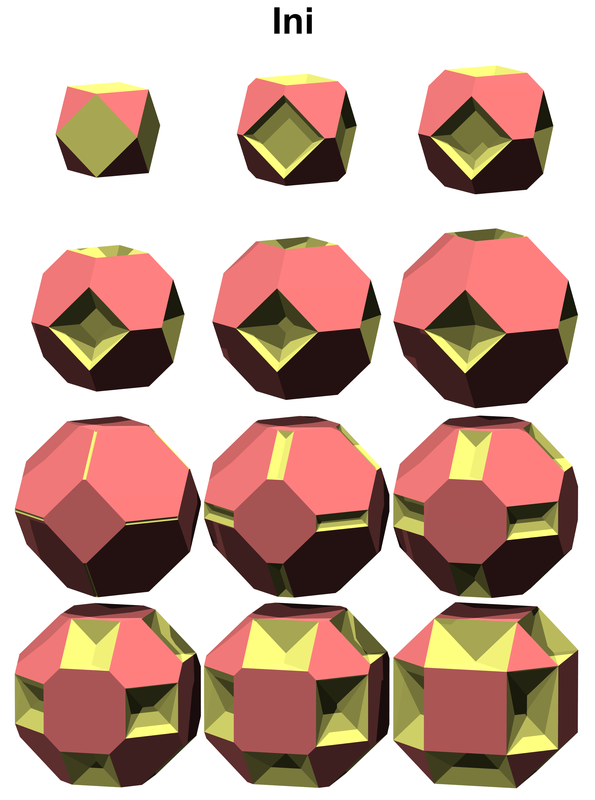 Its verf is a trigonal retroprism (3/2 antiprism). It has 115 pieces with 4 types, LOC = 23. 41. Pinnip - (PIN nip) pentintercepted pentachoron. 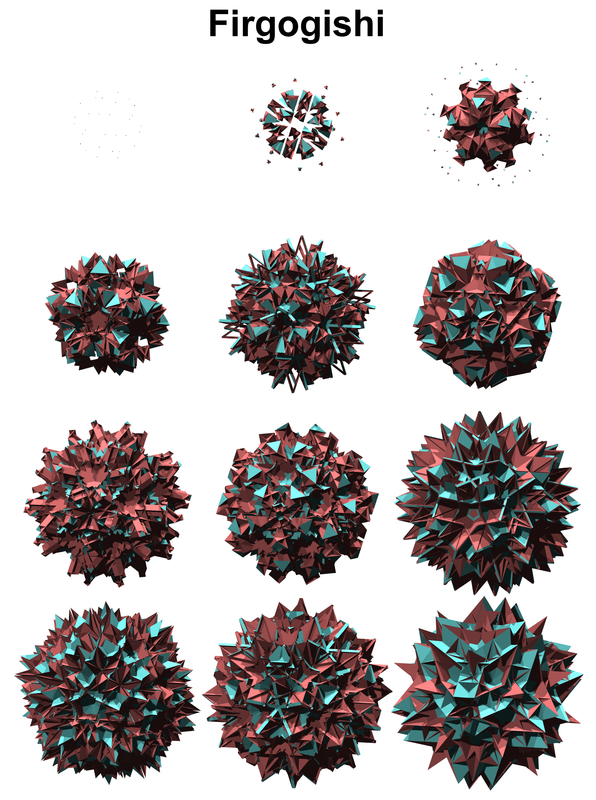 It has 5 octs and 10 trips as cells, and 5 pseudo-tets. Its verf is an inverted trip (trip with triangles indented in). It has 25 pieces with 2 types, LOC = 6. This regiment has tessic symmetry, it also has two extra demitessic members (sto and gotto) which are placed in category 12. 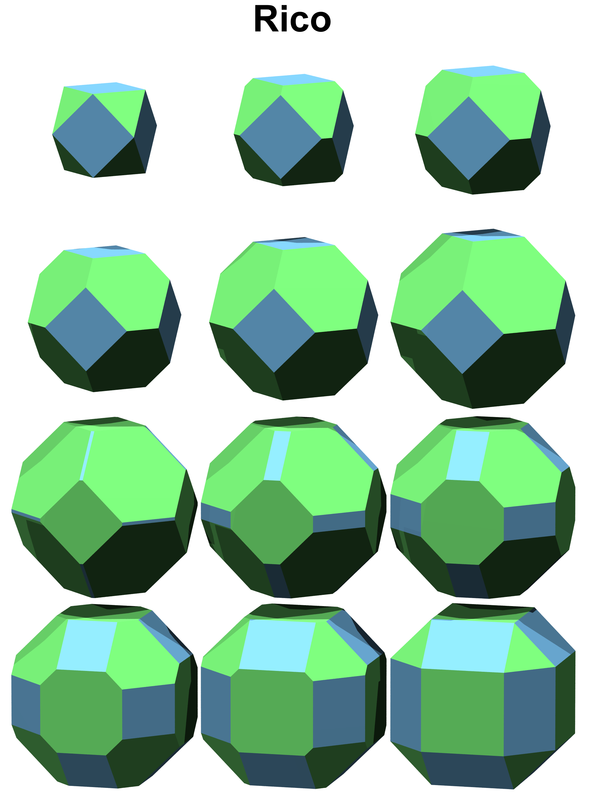 These all have 32 vertices. Rit's symbol is oox'o, it can also be oo$ (demi-tessic version). 42. Rit - rectified tesseract. 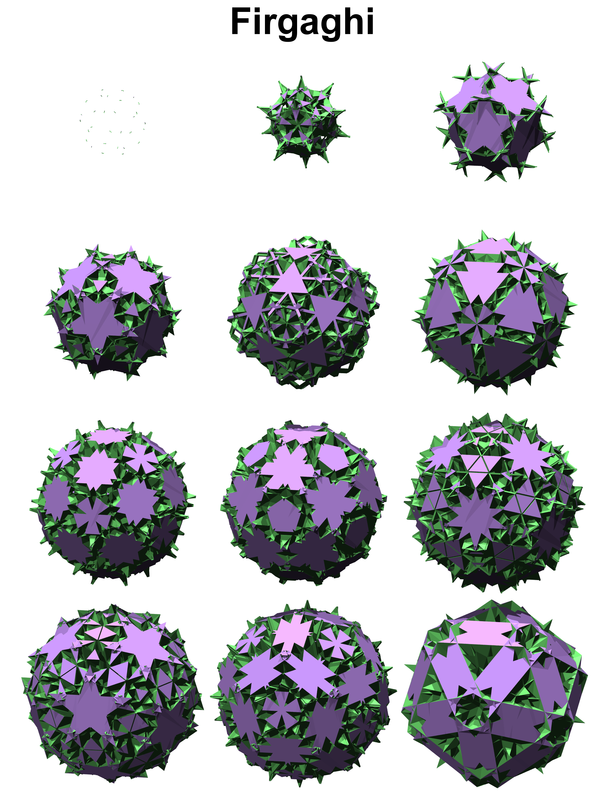 It is one of three possible 4-D versions of co (ico and spid are the others). Its cells are 8 coes and 16 tets while its verf is a longer trip. It has 24 pieces with two types, LOC = 3. 43. Firt - facetorectified tesseract. 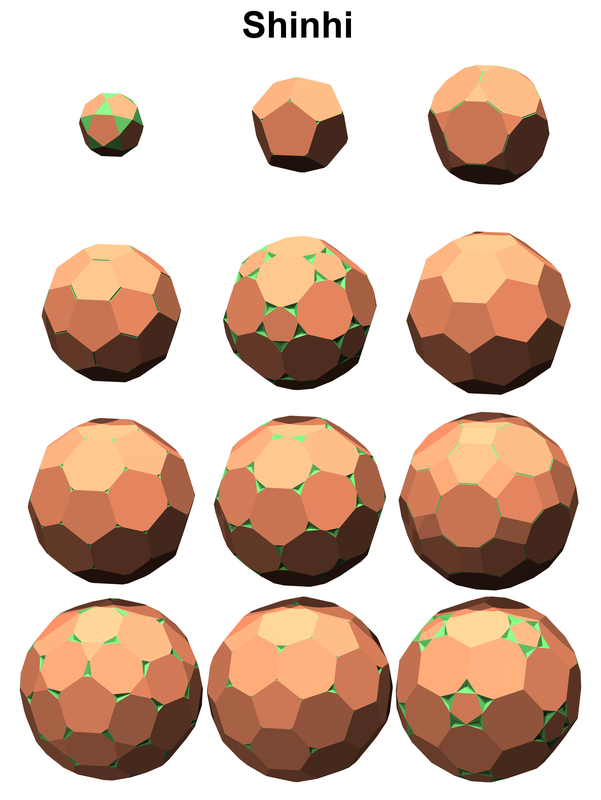 It has 16 tets and 16 tuts as cells, it also has 8 pseudo-ohoes. Its verf is a trigonal retroprism. It has 368 pieces with four types, LOC = 23. 44. Hinnit - (HIN nit) 16intercepted tesseract. 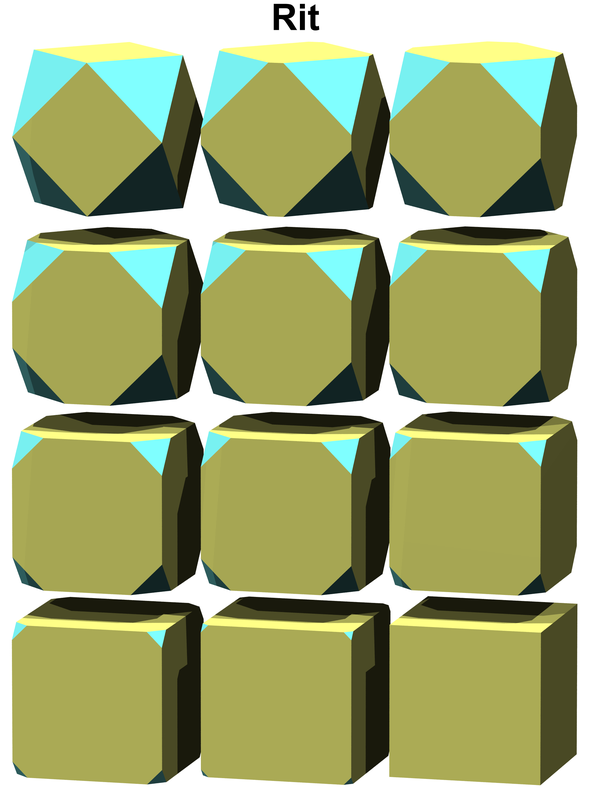 The cells are 8 coes and 16 tuts, it also has 16 pseudo-tets. Its verf is a long inverted trip. It has 72 pieces with two types, LOC = 6. This regiment has 7 members where three are in this category and the other 4 are in category 6. The three here have icoic symmetry, while the others have tessic symmetry. 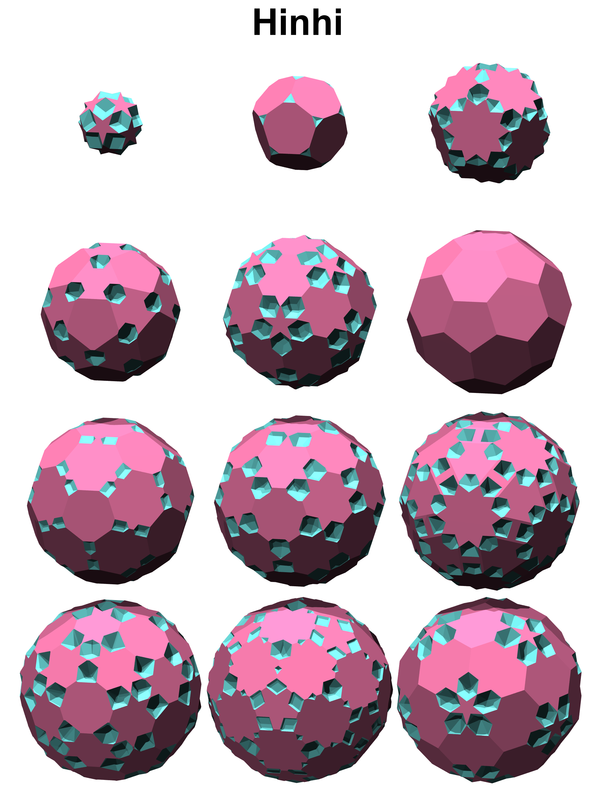 These have 96 vertices. Rico has three possible symbols: icoic - oo'xo, tessic - xox'o, and demitessic - xo$. 45. Rico - (RE co) rectified ico. 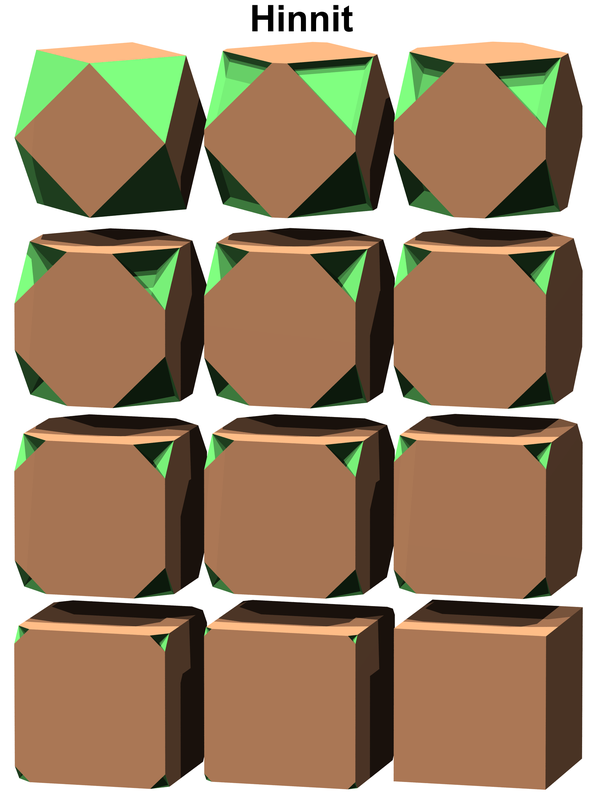 Its cells are 24 coes and 24 cubes. Its verf is a wide trip. It has 48 pieces with two types, LOC = 3. 46. Frico - (FREE co) facetorectified ico. 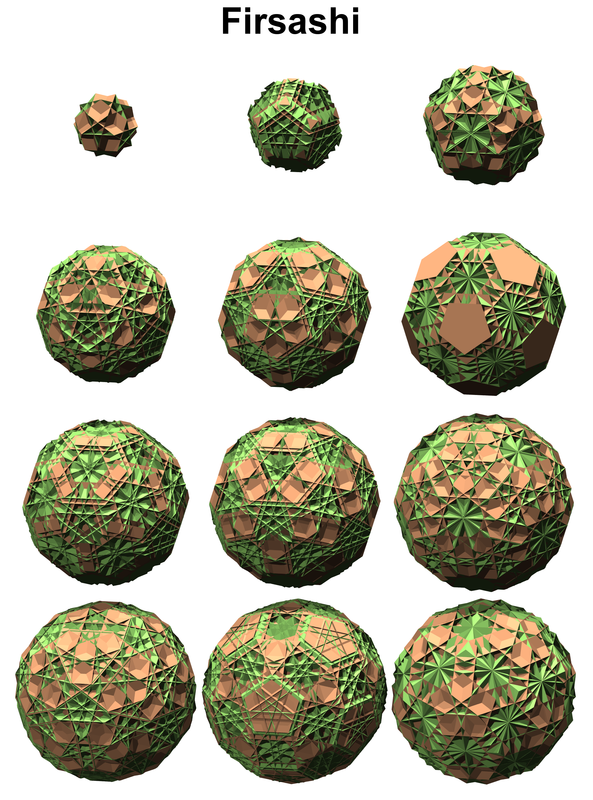 Its cells are 24 cubes and 24 toes, it also has 24 pseudo-choes. Its verf is a wide trigonal retroprism. It has 1032 pieces with four types, LOC = 23. 47. Ini - (I ne) 24intercepted 24. 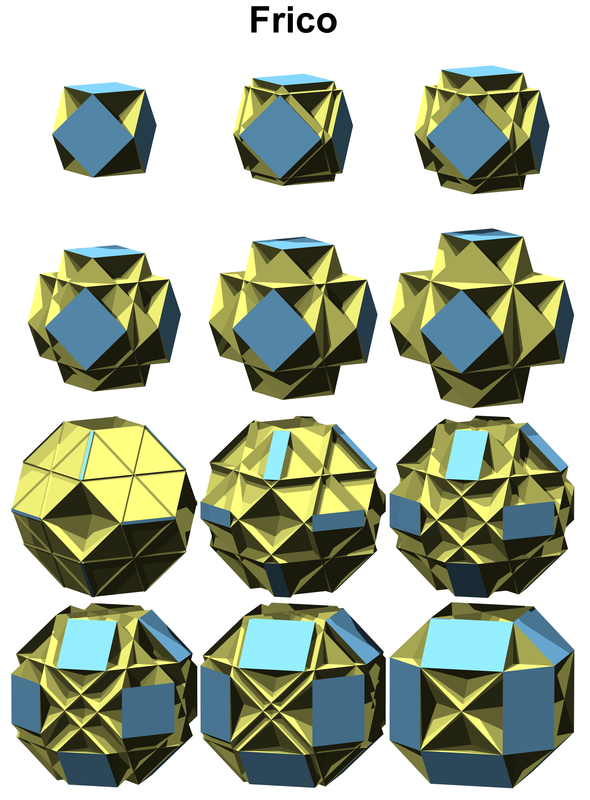 Its cells are 24 coes and 24 toes, it also has 24 pseudo-cubes. Its verf is a wide inverted trip. It has 168 pieces with two types, LOC = 6. This regiment has hyic symmetry. 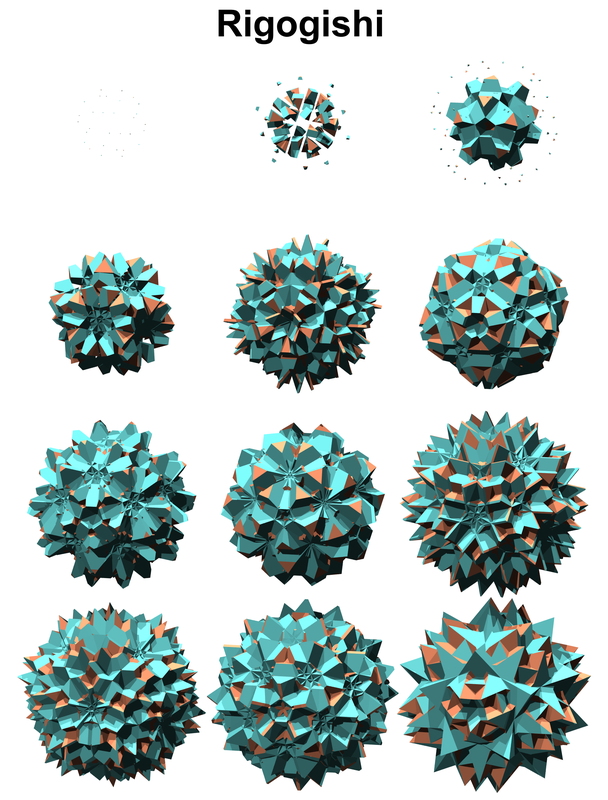 Each member has 1200 vertices. Rahi's symbol is oox^o. 48. Rahi - (RAH he) rectified 120-cell. Its cells are 120 ids and 600 tets. Its verf is a long trip. It has 720 pieces with two types, LOC = 3. This is the 4-D version of id. 49. Fry - (FRY) facetorectified 120. It has 600 tets and 120 tids, it also has 120 pseudo-seihids. Its verf is a long trigonal retroprism. It has 13800 pieces with four types, LOC = 23. 50. Shinhi - (SHIN hi) small 120intercepted 120. Its cells are 120 ids and 120 tids, it also has 600 pseudo-tets. Its verf is a long inverted trip. It has 2520 pieces with two types, LOC = 6. 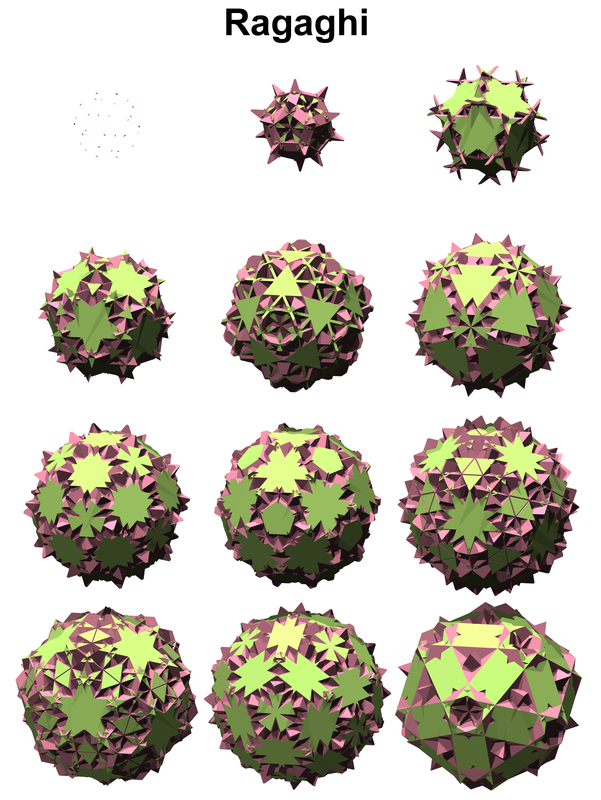 This regiment has hyic symmetry and 1200 vertices. Rasishi's symbol is oo^x*o. 51. Rasishi - (ruh SIS she) rectified sishi. Its cells are 120 does and 120 dids. It has a wide flat trip shaped verf. It has 2520 pieces with two types, LOC = 14. Rasishi is the 4-D version of did. 52. Firsashi - (fir SAS she) facetorectified sishi. Its cells are 120 does and 120 tis, it also has 120 pseudo-gidheis. Its verf is a wide flat trigonal retroprism. It is very intricate with 187,680 pieces of 23 types. LOC = 380 - It has the highest piece count and piece type count of this category barely beating firgogishi. 53. Hinhi - (HIN hi) 120intercepted 120. Its cells are 120 dids and 120 tis, it also has 120 pseudo-does. Its verf is a flat wide inverted trip. It has 7320 pieces with 2 types, LOC = 22. 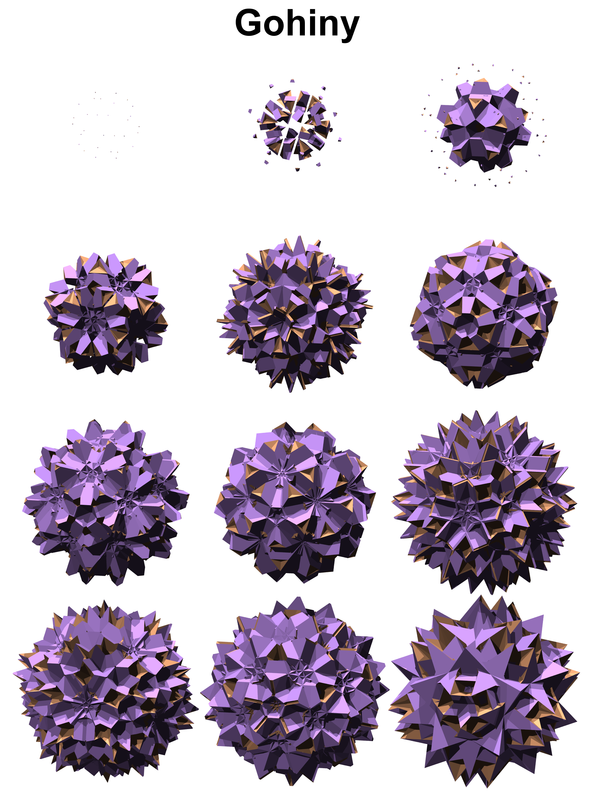 This regiment has hyic symmetry and 1200 vertices. Ragaghi's symbol is oo*x^o. 54. Ragaghi - (ruh GAG hi) rectified gaghi. Its cells are 120 gissids and 120 dids. Its verf is a long skinny trip. This polychoron has an interesting appearance. It has 34920 pieces with six types, LOC = 141. 55. Firgaghi - (fir GAG hi) facetorectified gaghi. Its cells are 120 gissids and 120 tiggies, it also has 120 pseudo-sidheis. It has a long skinny trigonal retroprism verf. It has 109,320 pieces in 13 types, LOC = 395. 56. Mohiny - (mo HI ne) medial 120intercepted 120. Its cells are 120 dids and 120 tiggies, it also has 120 pseudo-gissids. Its verf is a long skinny inverted trip. It has 164,800 pieces with 20 types, LOC = 448. 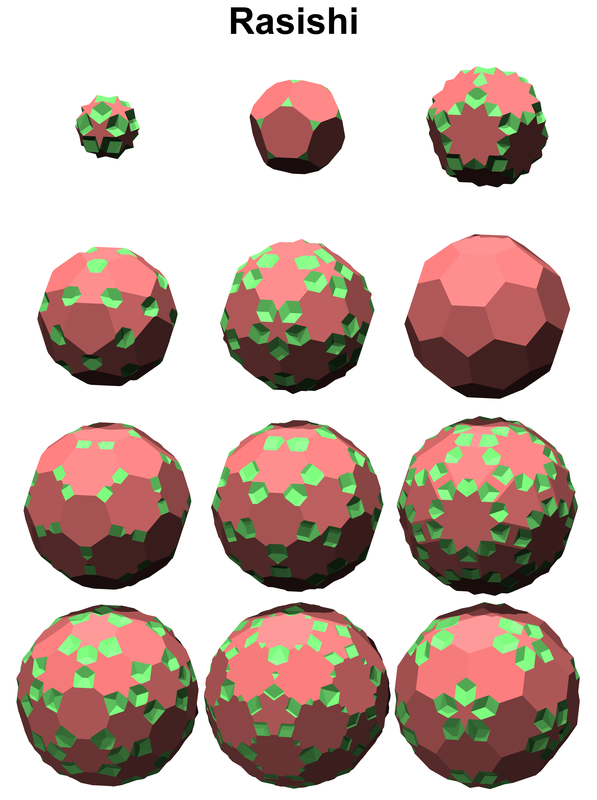 This regiment has hyic symmetry and 1200 vertices. Rigogishi's symbol is oox*o. 57. Rigogishi - (RIG go GISH she) rectified gogishi. Its cells are 120 gids and 600 tets. Its verf is a small trip. This is the 4-D version of gid. It has 27600 pieces with 4 types, LOC = 71. 58. Firgogishi - (FIR go GISH she) facetorectified gogishi. Its cells are 600 tets and 120 quit gissids, it also has 120 pseudo-geihids. 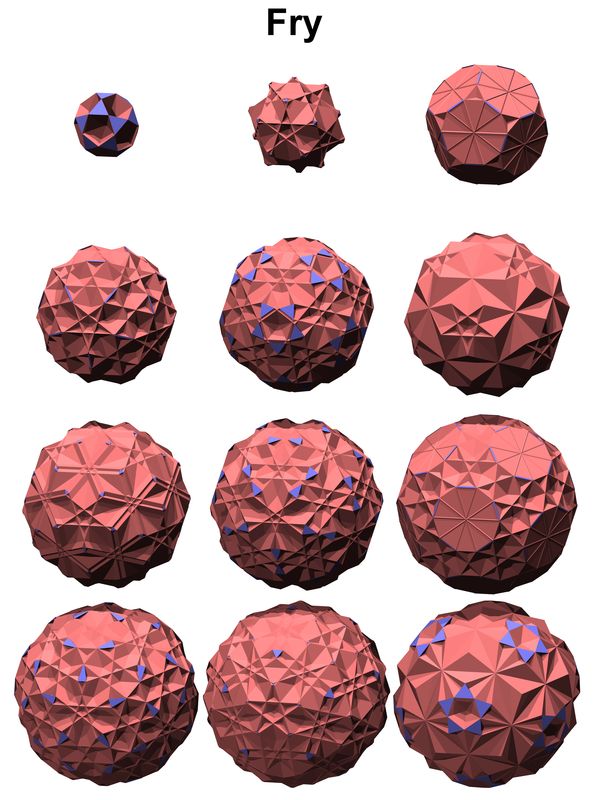 Its verf is a small trigonal retroprism. It has 187,440 pieces with 22 types, LOC = 547 - highest LOC in this category and therefore most complex. 59. Gohiny - (go HI ne) great 120intercepted 120. 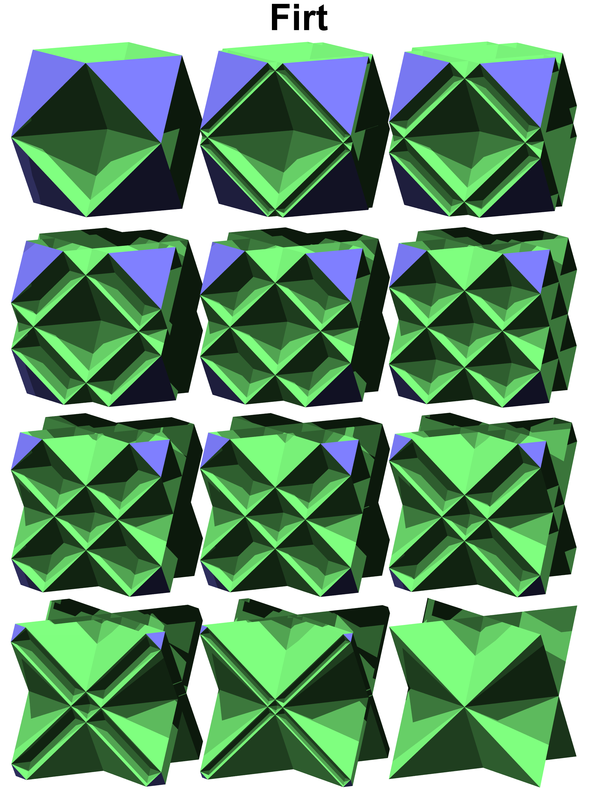 Its cells are 120 gids and 120 quit gissids, it also has 600 pseudo-tets. Its verf is a small inverted trip. It has 85200 pieces in nine types, LOC = 201. Below shows how the triangular rectates pair up as conjugates. The following are self conjugates: rap, firp, pinnip, rit, firt, hinnit, rico, frico, and ini. The following are conjugate pairs: rahi-rigogishi, fry-firgogishi, shinhi-gohiny, rasishi-ragaghi, firsashi-firgaghi, and hinhi-mohiny.